Info "It's easy to score when you get to move the target!" Dirty Darts is one of Fronk's microgames in WarioWare: Twisted! 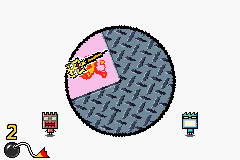 The game's purpose is to move the target and hit the colored angle of it with a Fronk. If done so, the game is won. However, if the Fronk hits the metal part, the player loses the game. 1st level difficulty: The angle is large. 2nd level difficulty: There are two small angles. 3rd level difficulty: There is one small angle.